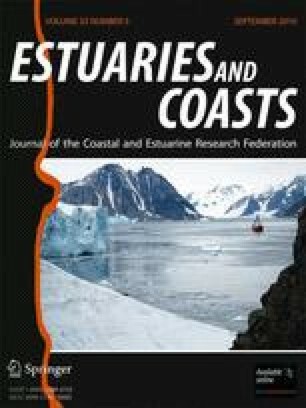 The composition and distribution of diatom algae inhabiting estuaries and coasts of the subtropical Americas are poorly documented, especially relative to the central role diatoms play in coastal food webs and to their potential utility as sentinels of environmental change in these threatened ecosystems. Here, we document the distribution of diatoms among the diverse habitat types and long environmental gradients represented by the shallow topographic relief of the South Florida, USA, coastline. A total of 592 species were encountered from 38 freshwater, mangrove, and marine locations in the Everglades wetland and Florida Bay during two seasonal collections, with the highest diversity occurring at sites of high salinity and low water column organic carbon concentration (WTOC). Freshwater, mangrove, and estuarine assemblages were compositionally distinct, but seasonal differences were only detected in mangrove and estuarine sites where solute concentration differed greatly between wet and dry seasons. Epiphytic, planktonic, and sediment assemblages were compositionally similar, implying a high degree of mixing along the shallow, tidal, and storm-prone coast. The relationships between diatom taxa and salinity, water total phosphorus (WTP), water total nitrogen (WTN), and WTOC concentrations were determined and incorporated into weighted averaging partial least squares regression models. Salinity was the most influential variable, resulting in a highly predictive model (r apparent 2 = 0.97, r jackknife 2 = 0.95) that can be used in the future to infer changes in coastal freshwater delivery or sea-level rise in South Florida and compositionally similar environments. Models predicting WTN (r apparent 2 = 0.75, r jackknife 2 = 0.46), WTP (r apparent 2 = 0.75, r jackknife 2 = 0.49), and WTOC (r apparent 2 = 0.79, r jackknife 2 = 0.57) were also strong, suggesting that diatoms can provide reliable inferences of changes in solute delivery to the coastal ecosystem. Financial support for this study was provided to EG through the Southeast Environmental Research Center’s Faculty Research Seed Funds Endowment and to LC and others by the grant from the National Science Foundation (EAR-071298814). The research was developed in the context of the Florida Coastal Everglades Long-Term Ecological Research Program (National Science Foundation, DEB-9910514). Many thanks are due to Greg Losada, Damon Rondeau, Carlos Tudela, Christine Taylor, Dariusz Kosiorek, Olga Saoulova, and Jay Munyon for their valuable field assistance and to Rafael Travieso for his help with GIS. We also would like to thank reviewers for detailed and helpful comments on the manuscript. I do not have any financial relationship with the organization that sponsored the research. I have a full control of all primary data and I agree to allow the journal to review the data if requested.